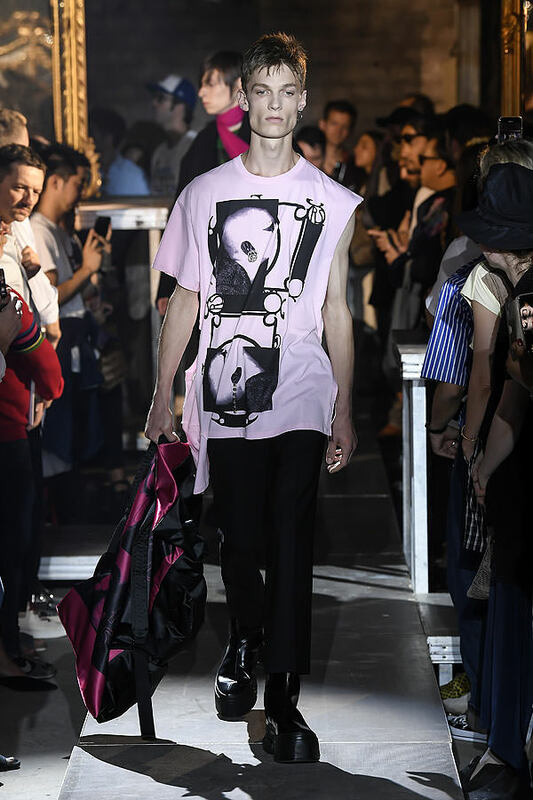 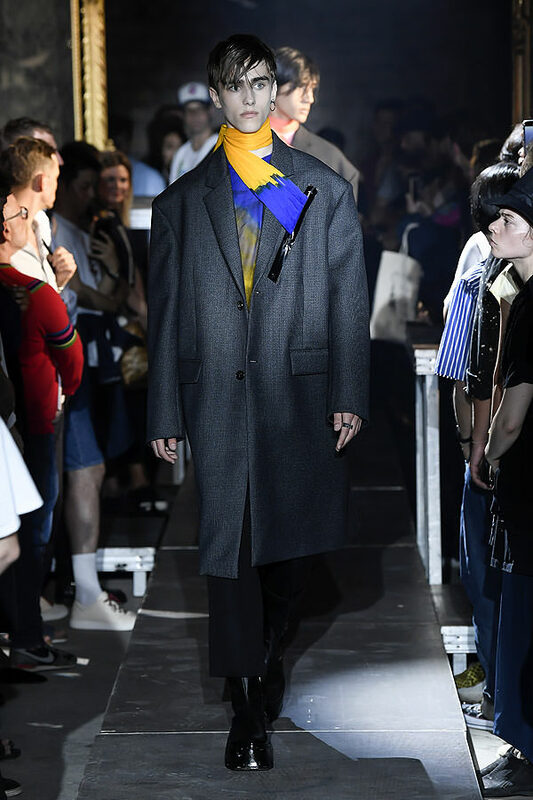 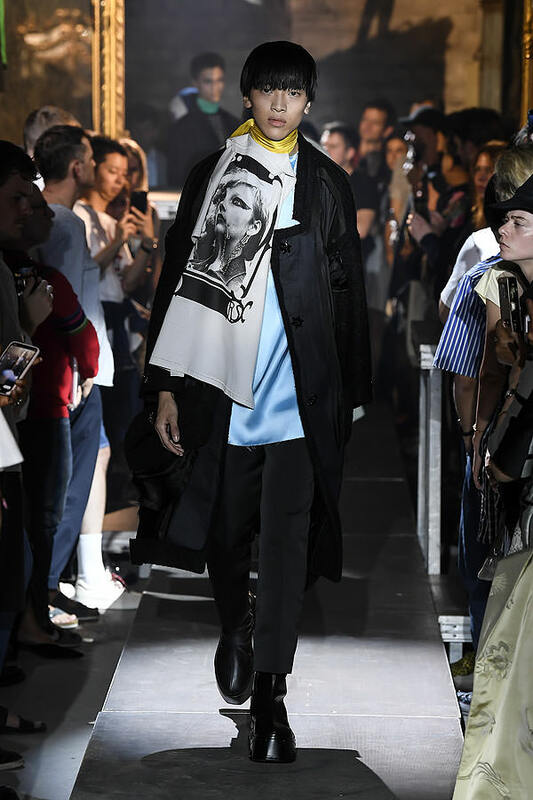 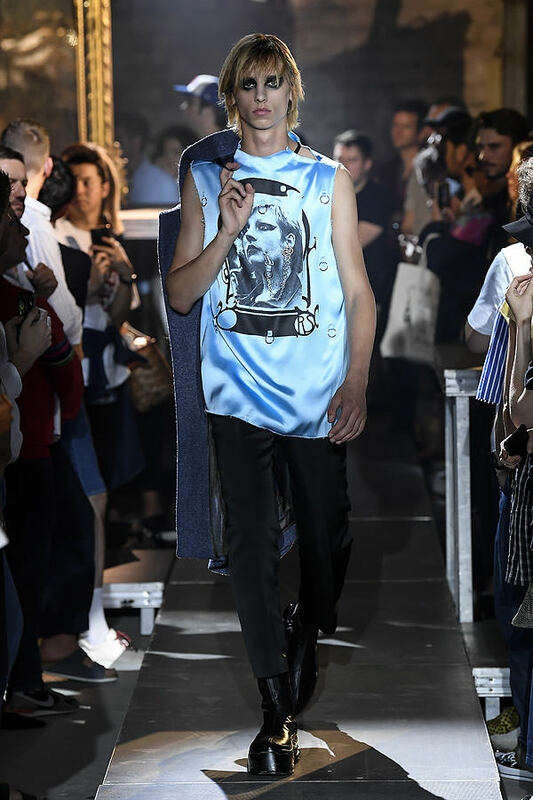 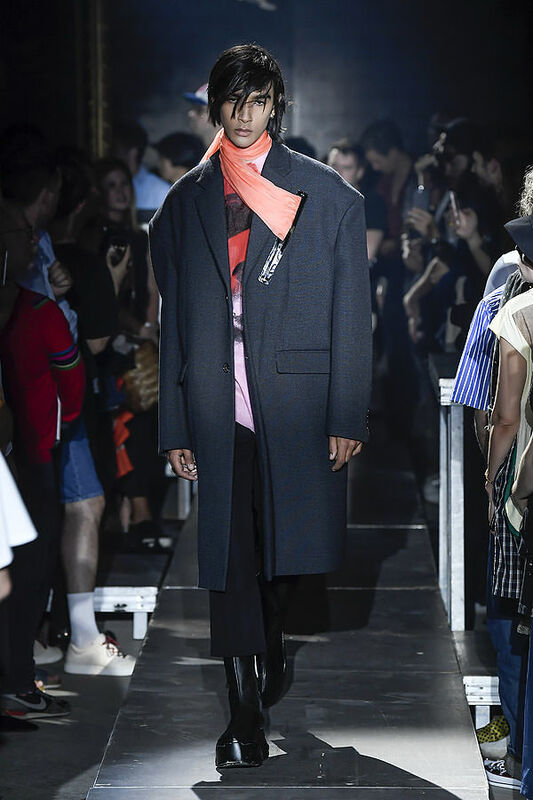 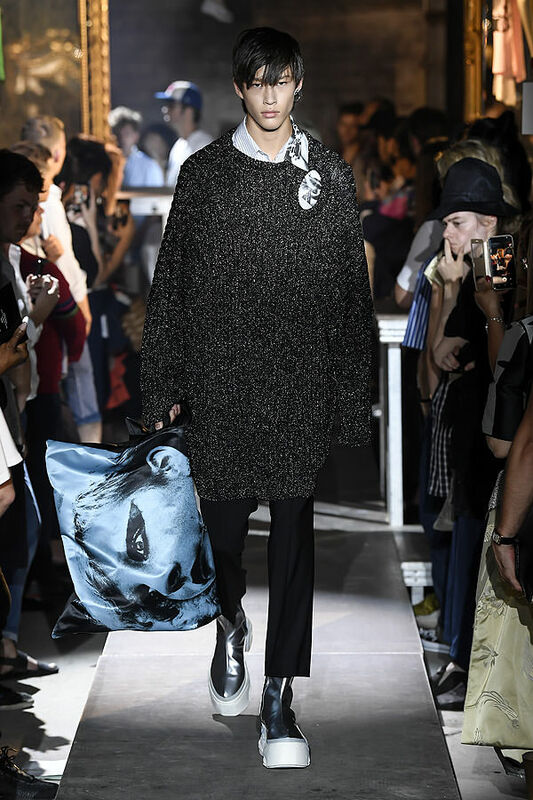 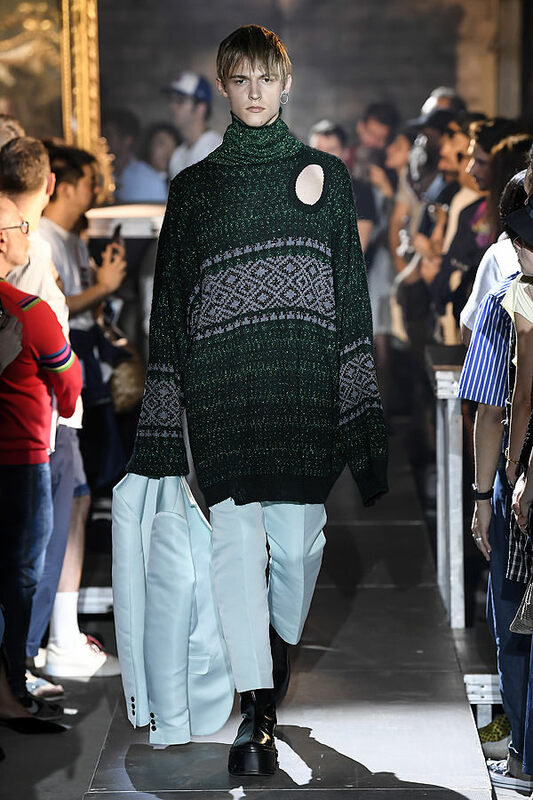 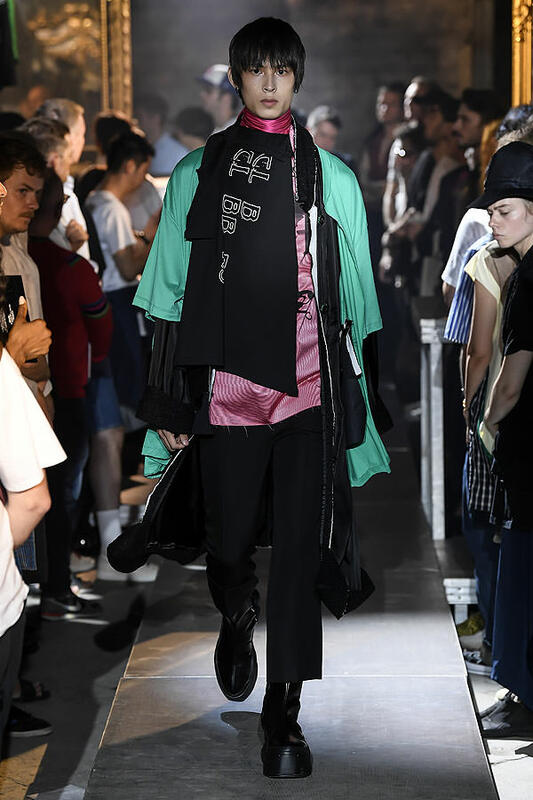 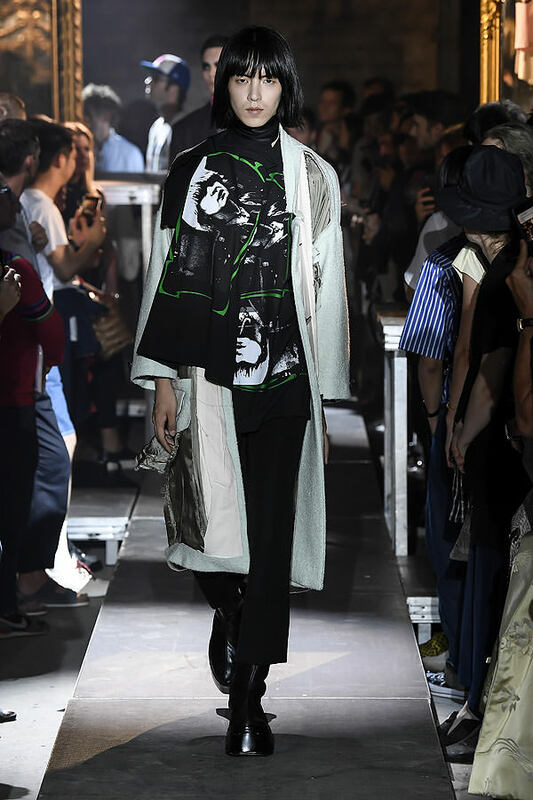 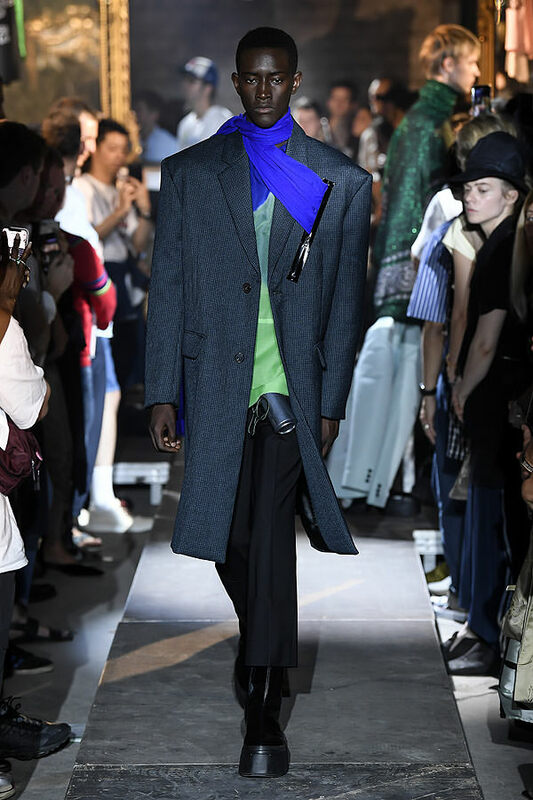 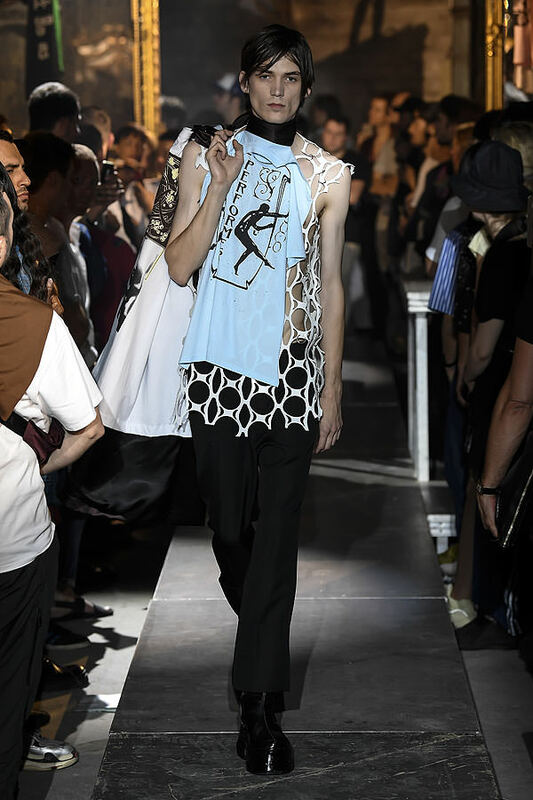 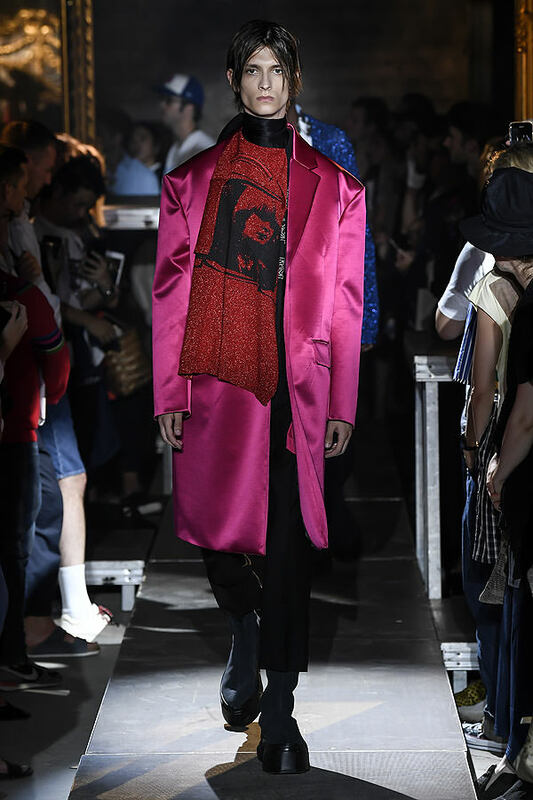 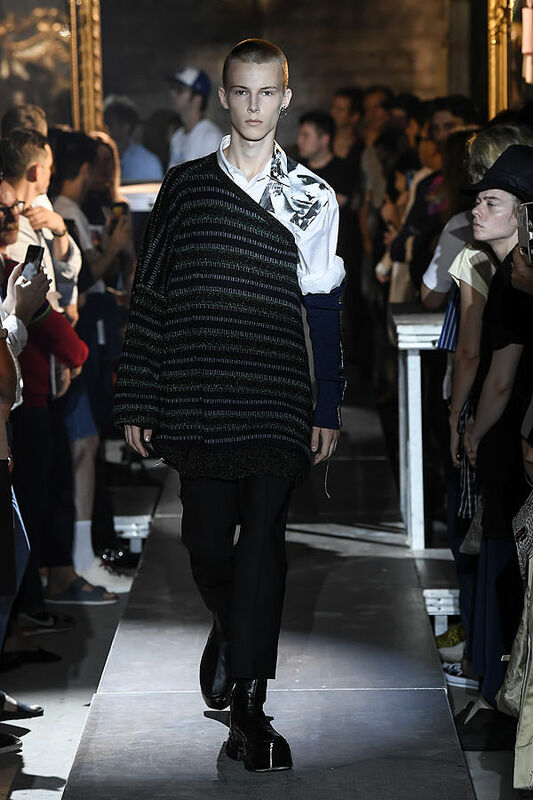 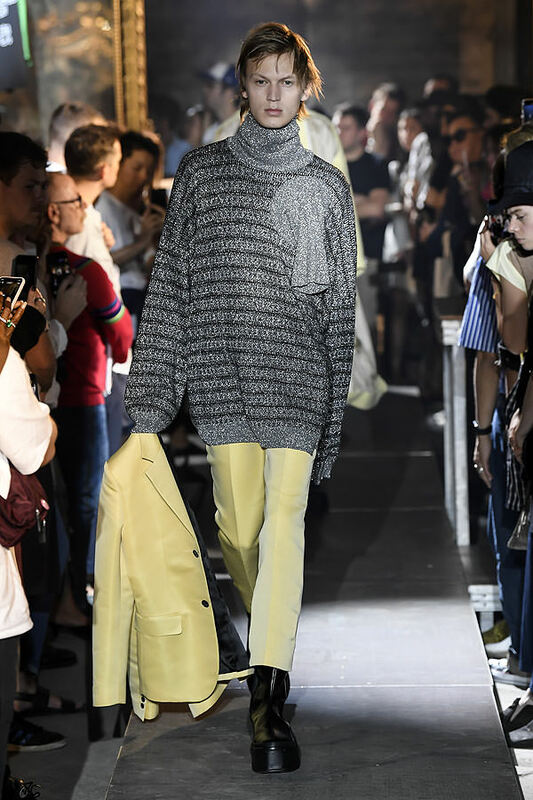 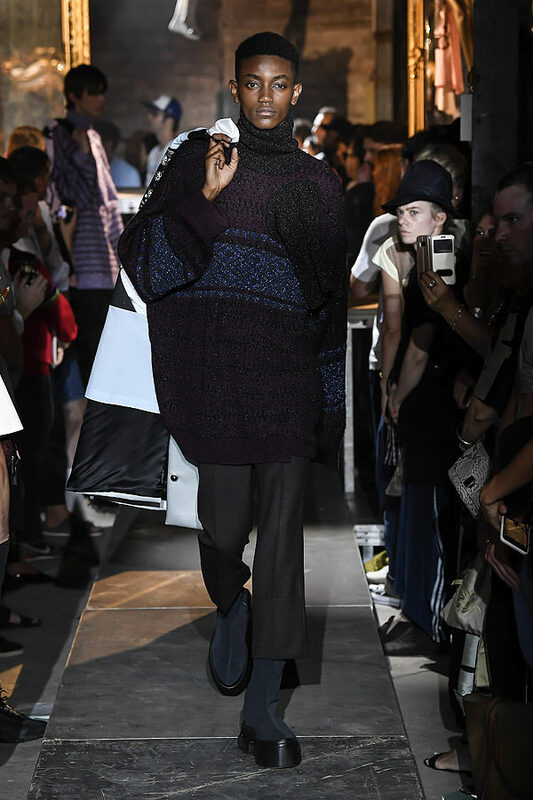 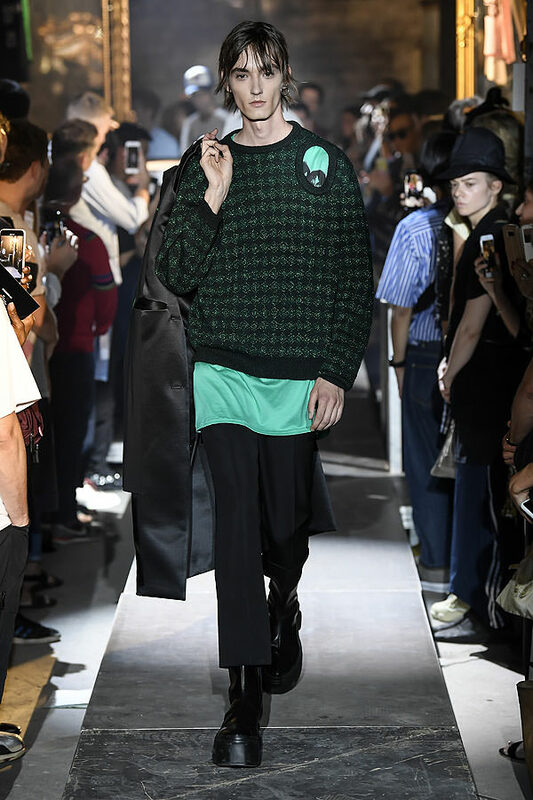 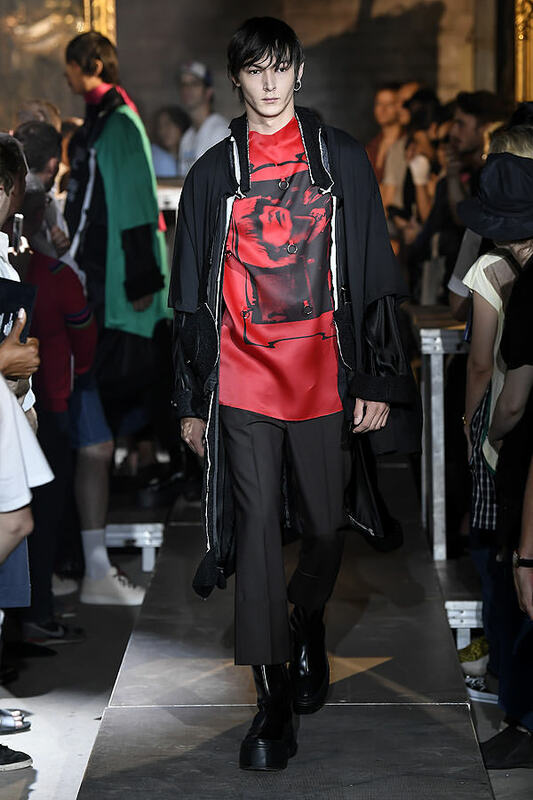 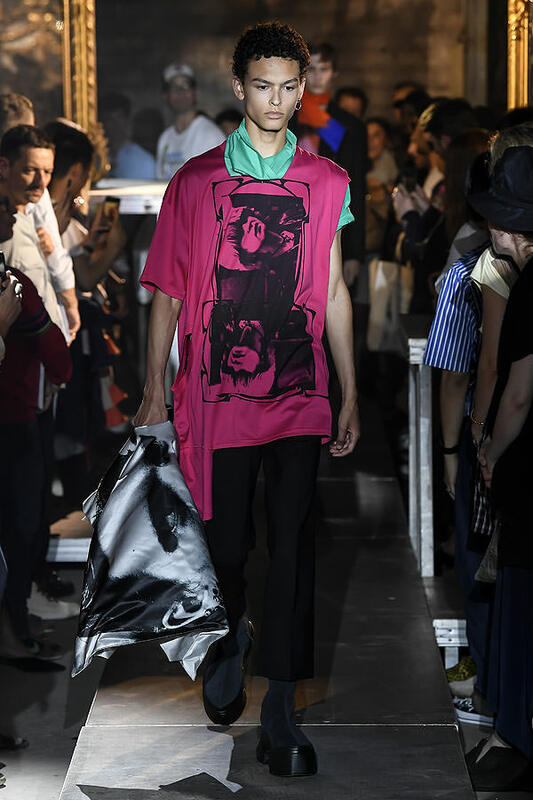 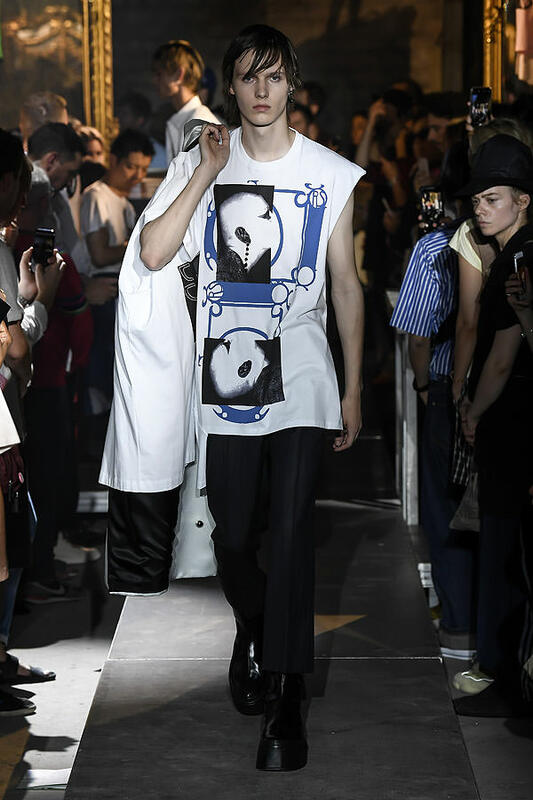 Raf Simons returned to Paris this season after his hiatus in New York settling in to Calvin Klein, and took us somewhere we’d never been before — Montreuil, a leafy suburb full of artists’ studios and artisanal factories that work with businesses in the city. 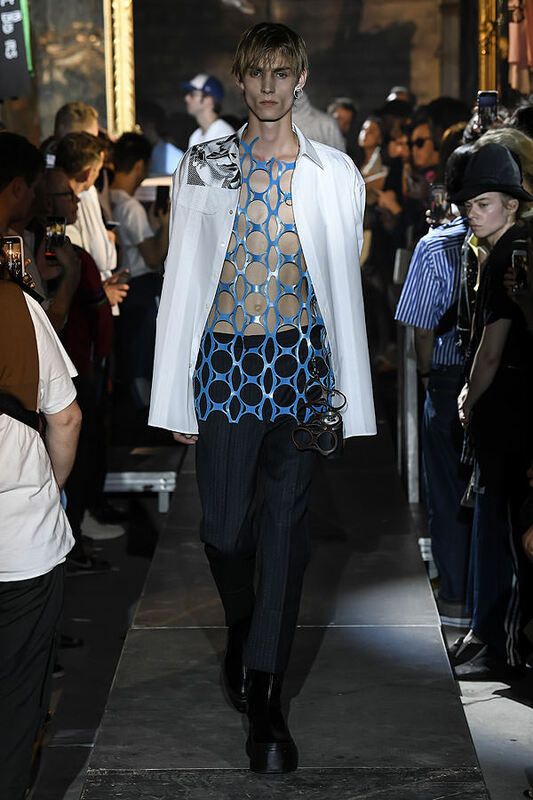 The venue had silver mannequins hung from the ceiling, some draped with T-shirting from the collection, and gaudy frames full of black-and-white grainy images of punks. 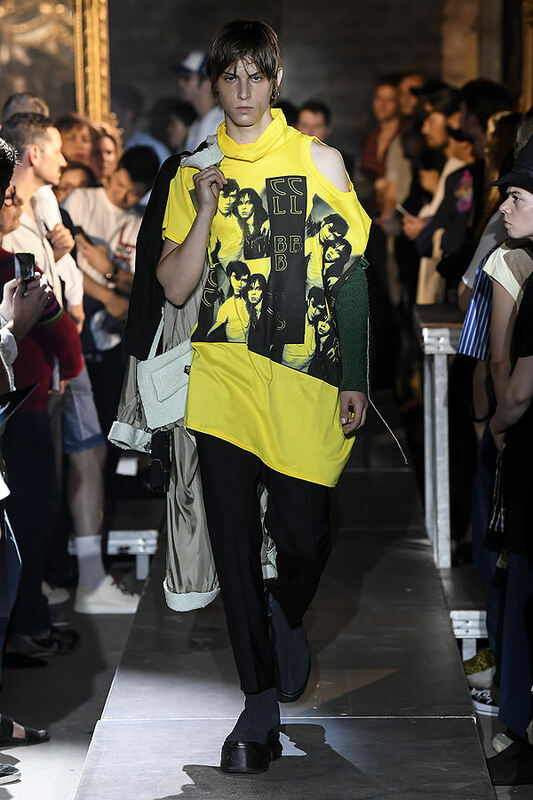 They looked like Derek Ridgers’ British punks, languishing in a lo-fi Derek Jarman set. 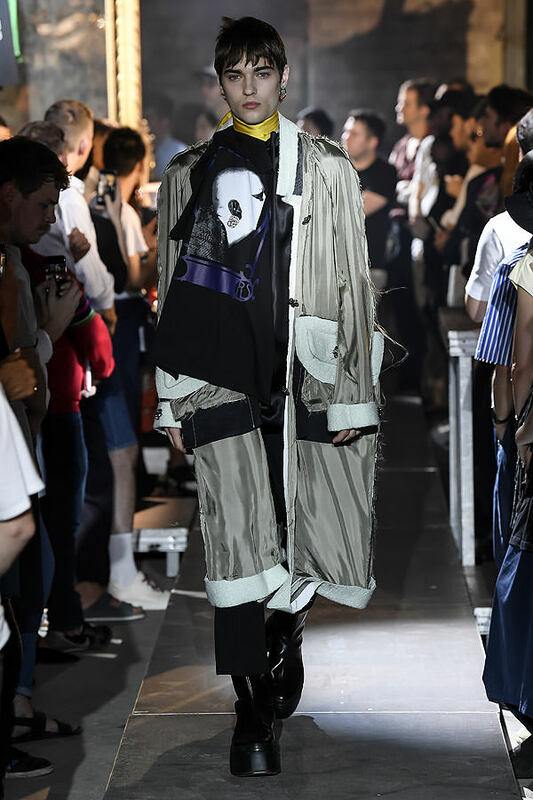 The music was classic Raf: opening with Bauhaus’ 1982 ‘Bela Lugosi’s Dead’ and segueing into Giant Swan’s IFTLOYL, a 2017 post-punk slab of techno. 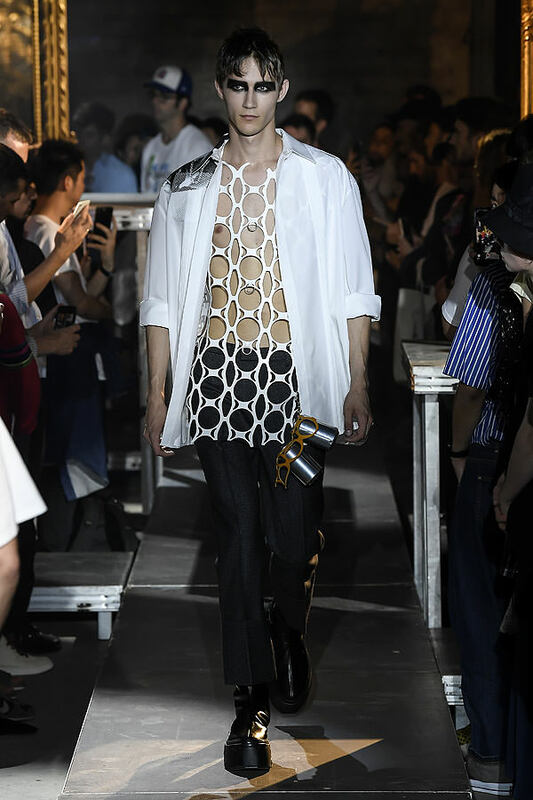 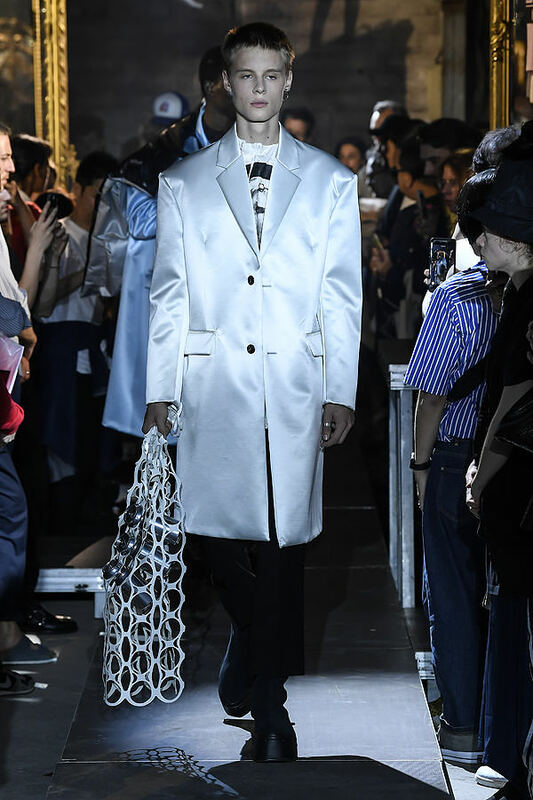 The collection was back-to-basics, referencing seminal moments of his career like the can jewelry from spring 2003, seen here as an accessory through perforated plastic tops and bags à la six-packs of beer punched through plastic and leather. 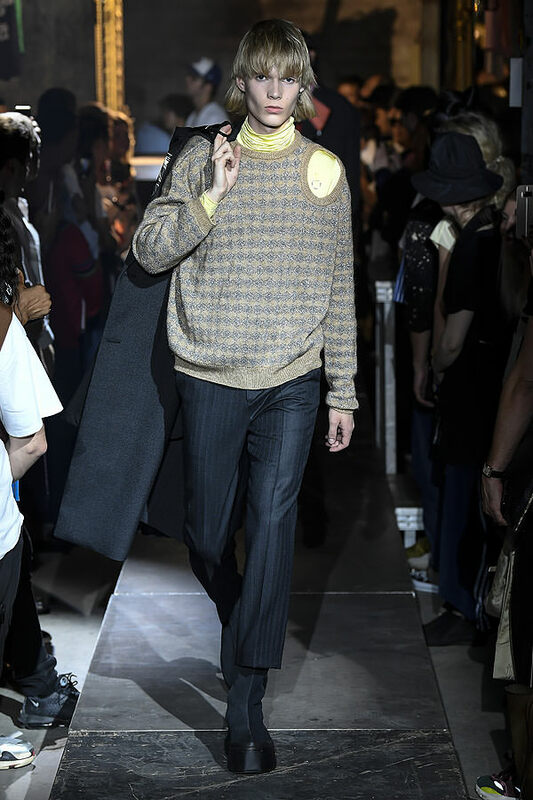 The hair applications of fall 2012 were revisited in swaths of lightweight high-color scarves that traveled in and out of the garments, often hugging the neck like a turtleneck. 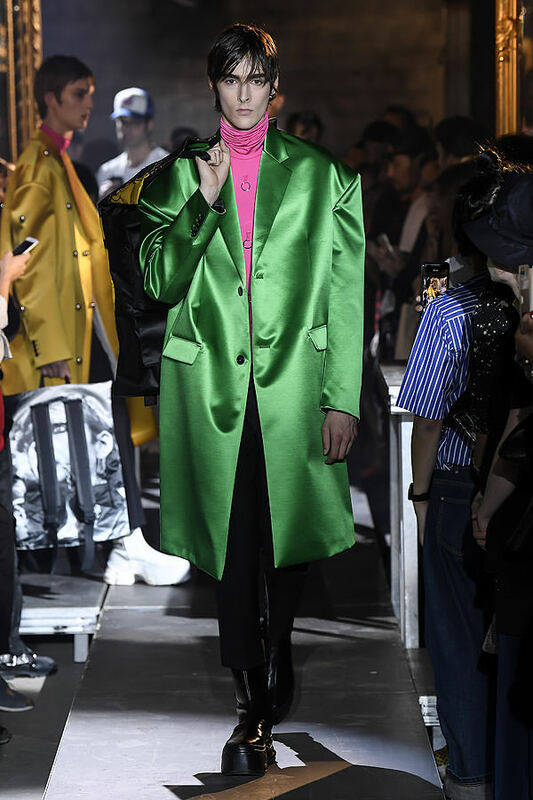 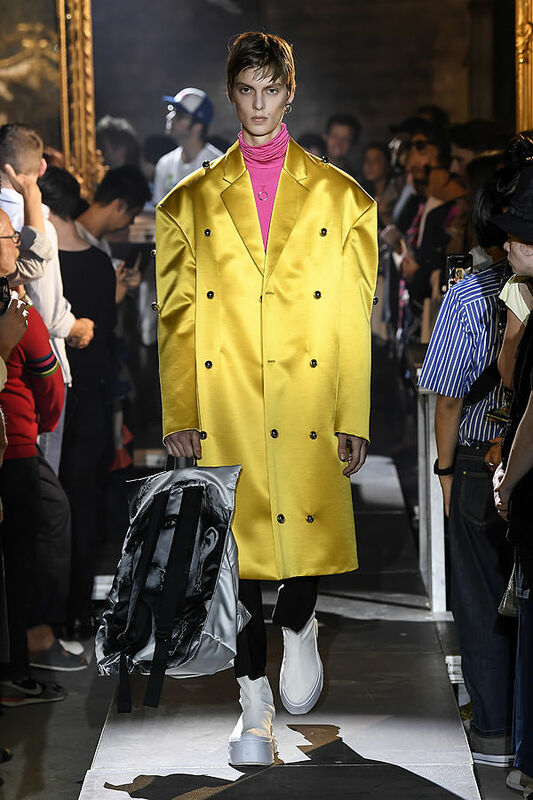 With impeccably tailored duchesse satin coating in acid brights that a teddy boy would kill for, it was evident that couture was on his mind, noteworthy in the skeletal deconstructed coating with revealed picked-apart seams and lining. 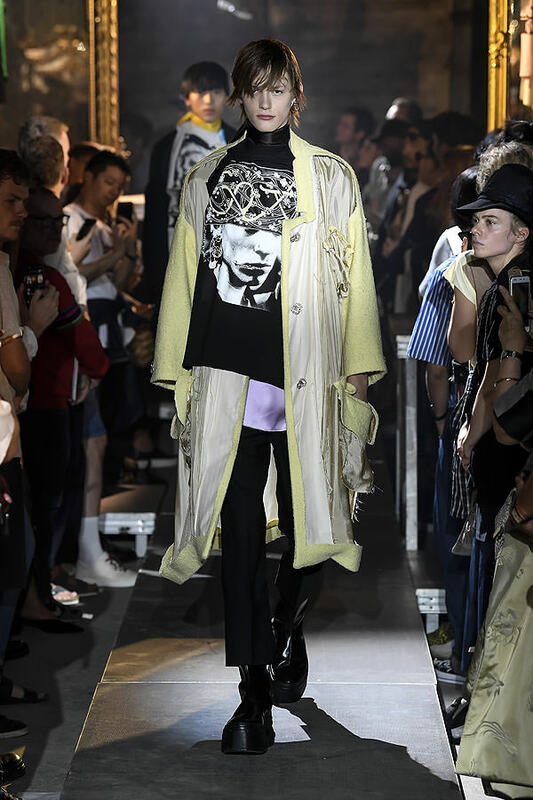 Despite the familiar tailored punk vibe, there wasn’t a single hoody or sweatshirt in sight. 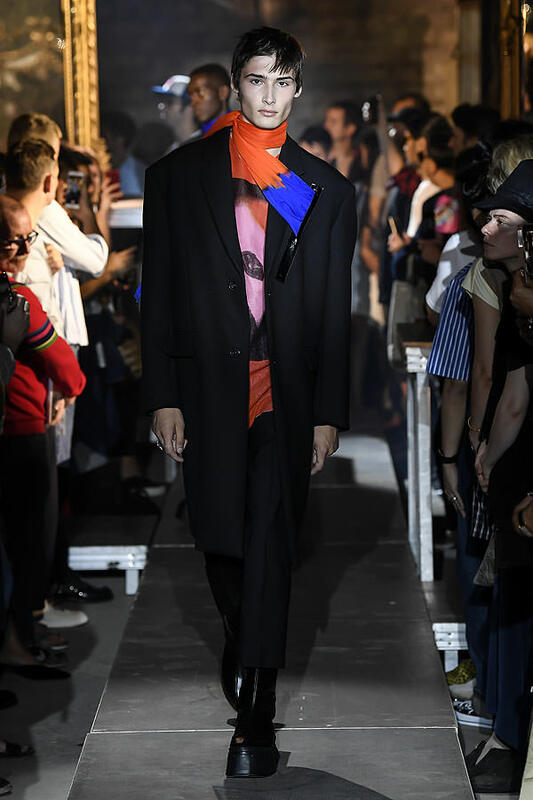 Was Raf saying it was time to turn the page? 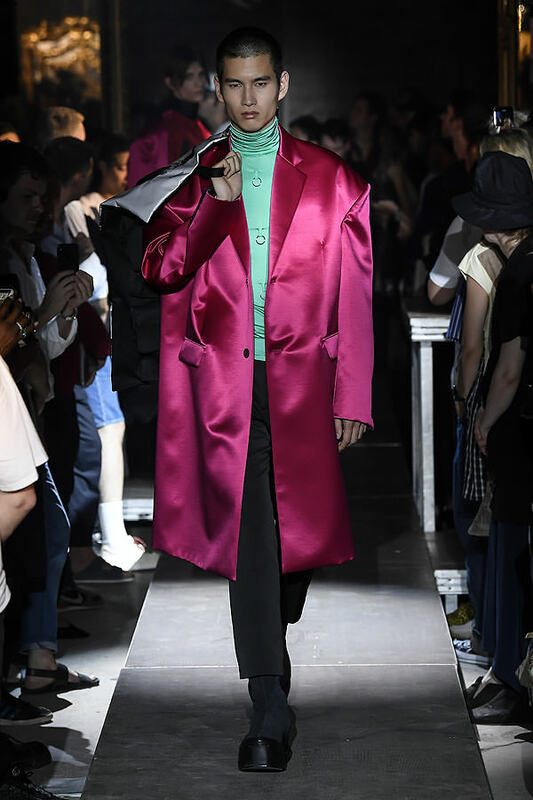 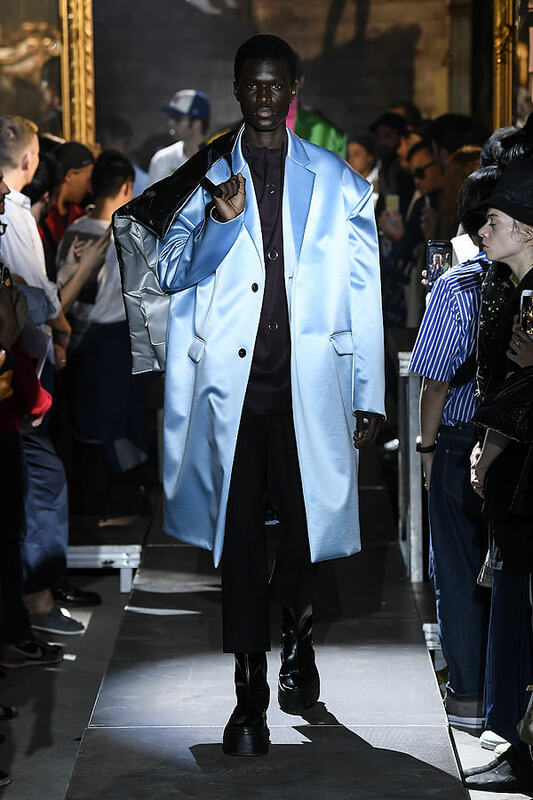 Of course he is the godfather of the street-meets-fashion aesthetic, so his couture-heavy duchesse satin extravaganza was a wake-up call — though let’s not forget that since his first collection he’s obsessed over boys in tailoring. 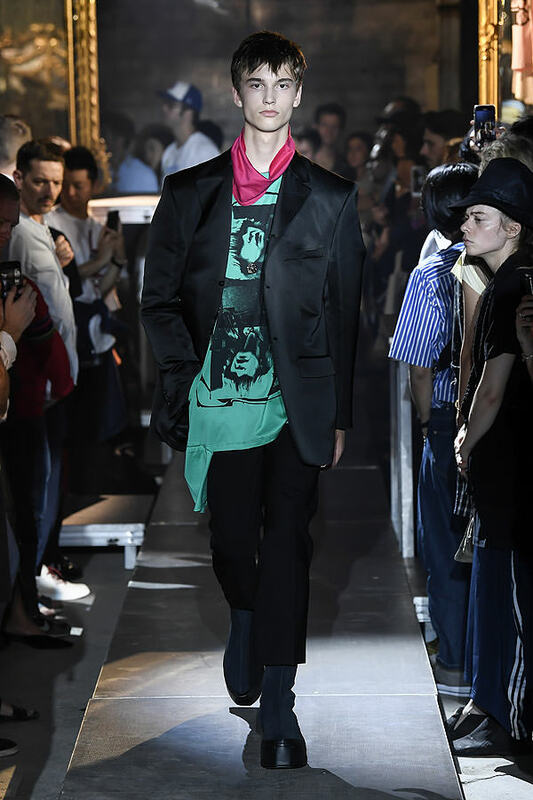 His punk was the new-wave punk that couldn’t afford denim so he trawled the charity shops for suiting to make himself stand out: probably ending up with a vintage Yves Saint Laurent dad suit, thrown over a band tee.